Within moments his eyes gazed upon the large tentacle blazing towards him, swiftly dashing to the side barely evading the gigantic end. As he gained some distance between themselves he launched his starfire, a power beam of purple light hitting the side of the creature, another roar like cry enveloped the area as the tentacle quickly withdraw away from the burning light. Stopping his power he panted for a moment as his energy was almost used up. Athena swerved to the side as ANOTHER tentacle went for her, and out of the corner of her eye she saw a flash of purple as she flew INTO the tentacle and started tearing into it with her fangs, claws, tail, everything. The tentacle whipped around, deafening shrieks coming from inside the mountain, but Athena persisted and started tearing at a section in the tentacle. it curled and slammed down onto the ground, repeatedly, but suddenly the tentacle snapped off with a sound of tearing flesh and the top fell to the ground,squirming as a shriek echoed throughout the valley "How the hell did a bloody Cathula get in here! Into Pyrriha?!" Athena roared as four more of them went for her and Nebula. "We have to destroy the brain!" she said. Gasping as he saw more lengths coming towards him, trying to dodge and dash away from their grasp. Hearing Athena he called out "Where's that?" he asked starting to feel worried he flew closer to Athena gasping "Any ideas?" Athena looked at Nebula as she dove under a whip like tentacle, the suckers squelching as it searched for the scales to latch on to. "Up there," she gestured into the mass of tentacles, at the very heart of the beast. They would have to fly at break neck speed, dodging all of the tenctacles and then blast their breaths into it's mouth and into it's brain. Athena didn't falter, she grinned. "Geromimo," she said to Nebula, before doing a back flip and speeding off. The tenctacles went into a frenzy and went for her but she dodged left and right, up and done, doing barrel rolls around the beast as it growled, searching for its prey. Nodding slightly he watched as she dodged and dived closer to the centre, following as best he could. Though it wasn't good enough, suddenly from his side a tentacle dashed against him, gasping from the power of the hit he lost balance and had to pull out otherwise not only his breath would be lost. Calling out to Athena he began to worry "Athena? where have you gone?" while on looking towards a sea of tentacles. Athena couldn't hear him, she was already inside the mountain. It was dark and cold and the only light from the sun was fading fast, but Athena could make out the large features of the room. She stopped short of a wall and looked down, head whipping around at a strange squelching noise. Bile rose in her throat and she was nearly sick at the sight of the mouth. Big and cucumber like, it wasn't actually a kracken, as she described, just a big cucumber with lots of tentacles. The mouth was inlaid with circule sets of teeth, the mouth drippling with saliva. It had no eyes or sense of hearing. All it has was smell. A baby. What was a Cathula doing in Pyrria? Probably breeding and spreading their genes. Wait, no it wasn't a Cathula as she had origonally thought. It was sort of like a "carnivouous plant," feeding on dragons and anything it could find. Ew. Athena shot an ice spike into it's big mouth and it stuck itself into the soft flesh. A shriek filled the air, but it didn't die. Athena knew outside the tentacles were searching for Nebula as she shot her icy breath, but, she wasn't well read in magic, and it only reached the top of the mouth. The creature shrieked and the tenctacles whipped around so fast you could barely see them. Frowning as there was no sight of Athena, hovering just above the sea of tentacles he suddenly heard a roar calling out his name. Gasping he sighed for a moment only to dive right back into the monstrous mess, dashing and dodge trying to get deeper into the mountain he only just managed to get past after taking a few blows luckily non of which grabbed hold of him. "Athena! Are you alright?" flying up next to her as the loud sounds made it had to hear. As he was waiting for a response he gazed towards the ugly creature below, frowning at the sight feeling a little fear from the amount of teeth circling its mouth. Guessing what she wanted him to do he charged up his attack seemly like he was drawing power of the air, with a blue glow encasing his mouth. "I'm fine!" Athena exclaimed, grinning down at the beast. "nothing i can't handle!" She watched as he started charging up his breath attack. he was smart, knowing what she needed and wanted him to do. Actually that sounded.. really wrong. Was her mind turning dirty-dirty? Athena wondered this as she shot her breath and tail spikes at the creature, keeping it busy as she flew inc circles dangerous close to ti's mouth, shooting down at it's teeth. As Nebula let loose his breath, a blue light beam of pure energy and heat left his maw. Firing towards the creatures mouth, following with a large explosion shrieks of pain echoed around them, frowning from the loud noise deafening his ears he looked towards Athena as he on looked at the creature clearly wounded amazed how much damage his attack really did. Soon enough the loud pain cries ended sighing in relief he shouted towards Athena still effected "IS IT DEAD?" Athena watched the "Cucumber Plant" shriek and writhe, before dying. Athena listened for any groans, any sounds. None. She nodded. "Yes," she panted, flying over to Nebula and hovering beside him, white wings keeping her airborne. "Yes, it's dead." That was.. That had been.. Exhilerating. She was sweating, and she had a mark on her leg from where the tentacle had managed to nick her. A few scales had come off and it was red and bleeding. She didnt notice. Much. Smiling with a tired expression he replied "Then lets get out of here.. that last attack has exhausted me.." Closing his eyes for a moment he almost drifted into sleep but quickly shaking his head in alert before he fell. While looking towards Athena he noticed her blood dripping from her foot, gasping slightly he quickly pointed it out "Hey! Your bleeding.. Are you alright?" frowning in concern he moved a little closer moving to her other flank to see the damage. "That looks nasty we should rest back on the ground and see to that.."
Athena nodded and turned in the air. She realised he was falling asleep and went to turn, but he shook himself awake. She glided oit of the cave and jumped at his sudden exclamation. "Hmm?" She glanced down at the wound. "Oh, that? Its fine, mothing major. Ugly thing nicked me on the flank, thats all. Its okay." She hovered as he moved closer to her and chuckled. "Nebula, really, I'm fine. I've suffered from being paralyzed while fighting a hydra." She then stretched out her wings and glided to the ground, making sure to land a way's away from the tenctacles sprawled out over the mountain. Smiling again and chuckling slightly from her response he glided towards the ground where she was heading, only to get hit by another wave of tiredness but it proved to much his body needed energy. Just before landing he fainted mid air crashing against the ground, covered in a few scratches here and there from the tentacles and the impact. With his eyes closed and still breathing his body took charge as it absorbed as much light as possible from the fading sunlight. Athena heard a thud. Thinking it was a tenctacle coming for them, Athena whipped around at the noise, tail lashing and frosty breath tickling her throat. When she saw him, her eyes, the brightest blue, widened and her black pupils narrowed to thin slits. 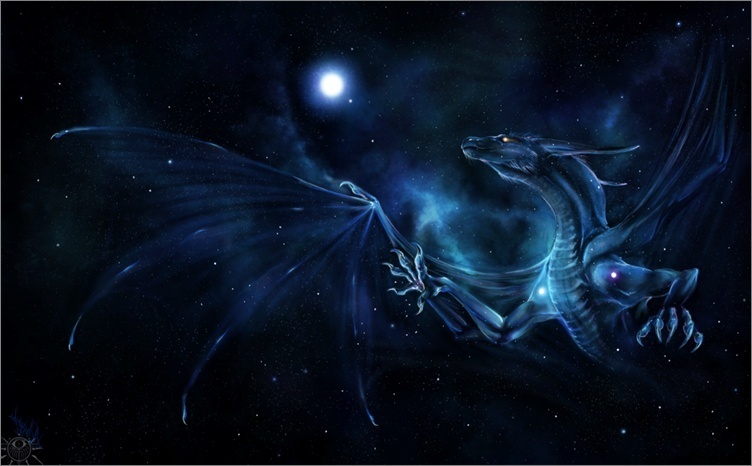 She rushed over to Nebula, flapping her wings to give her speed, even though he was only a metre or so away. She nudged him, but got no verbal response. "Oh, hell," she muttered. She glanced around for cover. Wolves and bears, and even other cannibal dragons, could come along nad take advantage of Nebula's moment of weakness. She found a tree that could conceal them both, and grabbed Nebula by the neck, like a mother wolf would do with her pup, and slowly started dragging Nebula to the tree. Her muscled ached from the strain, and knew she'd need to massage herself later. Annoying, since it took a lot of effort to massage yourself, according to her. Placing Nebula in the shade, Athena laid beside him, close enough they nearly touched, but far enough away that they didn't. Sitting up again, Athena watched over Nebula, tail swooping over the grass like an eagle swooped over it's prey. A rabbit perhaps, or an unfortunate elk or even a wolf. She had since an eagle take down a yak once. Impressive, if she said so herself. Still unconscious his body soon realized as he was placed in the shade, shivering from the coldness his mind suddenly awoke. "GAH!" he shouted panting quickly as his body left incredibly cold. "A...Athen..a ww..why is it soooo... cold.." frowning slightly he noticed that the sunlight had all but gone, he needed something to eat fast or get under the moon light otherwise his energy would all be gone leaving him more exposed. He couldn't risk flying up high otherwise if he where to faint again the fall could kill him. "You... havn't got anything to eat have you? M...my body needs energy fast..."
Athena jumped and hissed as he awoke with a start. He had scared her! Well, not scared.. Athena didn't get scared. Seriously! He had just.. Startled her. Yes, startled was a far better word. "What? Nebula, we're both in the shade, how are you freezing?" She inquired after, briefly, explaining that they were in the shade. For protection! She nodded at his words. "Of course. I'll be right back," she hurriedly stretched her wings and took off off the ground and into the air. She flared her wings and her insides did flip flops as the ground was carried away from her. A beautiful feeling. The feeling of being able to do what you wanted. The feeling of hope. The feeling of- she couldn't describe it. She was in look this time. Just over in the next meadow was a small herd of deer. Athena went upside down as she glided above them, smirking. She then pulled her wings in close to her body, snapping them shut as she started to fall at an astonishing, to her, speed. How could she go so fast? How did her species go so fast? She loved it. Athena outstretched her claws, resembling a large eagle, make that a VERY large eagle with four horns and a scaly body. Oh, and it could breath frost. The deer scattered as a shadow fell upon them, but Athena got two with both her talons. They were tiny compared to her after all. She held one in each claw and crushed them, a quick, merciful death, if a little delayed. Athena turned and took off again. Then it hit her. Why was she doing this? For a dragon she'd known only for about an evening and a morning? She sighed softly as Nebula came into view. She wasn't going soft, was she? She had to stay violent and non-trusting, she had to! Athena dived, and suddenly the ground was rising to meet her. She snapped open her wings and felt her bones strain and click into the wrong places from all of the training sessions. She needed to get Atrex to get her massage oil. It would help her bones quite a bit. Using her wings to pull herself forward, Athena managed to half waddle, half run over to Nebula, placing the deer at his paws. She then stepped back, glancing around for danger. Waiting with his snout in his paws, still shivering as his body heat was low. As she returned he tried to smile, "Thanks... I'm cold because my body needs energy, since normally I get energy from sunlight, but eating helps too." Sighing he started eating one of the deers using his talons to slice his meal. "I'm sorry... You did amazing back there.." Blushing slightly he rested feeling his energy returning. Athena watched him shiver and wondered why he was so.. so cold? okay, she was an IceWing, sos he was used to cold, but Nebula.. Nebula was't. And that was the problem. Were Starlings similar to Firewings? She hoped not. But she got her answer a second later when Nebula spoke. Oh. "My bad," she muttered, glancing away. His next words caught her off guard. "Hmm?" she looked at him and inclined her head. "Well.. thank you, Nebula. You did too.." she looked at her wing and used her claw to try and click her muscles back into place. Sounded awful, but really the muscles were just exhausted. She had been pushing herself to the limits with her fights and spars. "Did I tell you about my friends?" she asked him. Then realised she hadn't. "Storm, Ender, and Atrex. Great guys, you'd like them," she rolled her wings forward and looked at him again. "Just watch out for Delilah. She's a snake. She got me blinded, deafened, and unable to smell for an hour," she said. That was the first time she'd cried from pain. In years. Ah well, pain lets you know you're still alive. "She nearly got us all killed," she added. "B---h," she muttered, glancing at the sky. She didn't mind swearing, just as long as she didn't do it too often. She then smiled at Nebula. "You have any buddies up in the stars? Family?" she gestured up to the sky, looking up at the great blue world. She had never actually tried to go that far yet.. She must try it sometime. Frowning slightly as she asked him about family, "well.. I lost my family... It all happened to quick I've had children... But I don't know where they went.." Turning towards her with a saddened look he continued "What about you? Its nice to have friends.. But what about your family?" Coiling his tail around in the grass feeling slightly ashamed. Athena's gaze softened at his words. He was like her. No family. No hope to see them again. Just another dragon with a sad life. She tilted her head at his question and her eyes were casted downwards. "Well.." She hesitated and curled up slightly. Should she really be telling her story to a dragon she had just met? Athena looked at Nebula, and then she started talking. "Nothing really. Had parents, a sister. Small and happy. Then.. Well, father was murdered by a nightwing when we strayed onto a battlefield, and my mother.. Well, we set up camp in a temple and, being a curious hatchling, activated, accidently of course, a spell that sucked my mother into another realm. My uncle," she clenched her claws. "Took me in, called me his little Ice Princess. He trained me and Hera into top battle dragons. 'Course, that wasn't to last. That son of a b---h wanted us to kill each other to show who was stronger. So he locked us in a cave, and then Hera.. Well, she.. Killed herself. So I ran, and here I am." She raised her eyes from the ground again. "When you are betrayed by the only one you thought you could trust, it hurts. Thats why I hate making friends. Not worth the trouble. You get hurt all over again." She stood up and glanced at the huge corpse that was the "plant," which was now stinking to high heaven. Athena looked at Nebula again. "Let's go somewhere safer then here."